Dinner parties are a fun and relatively low-key way to spend time with your friends and enjoy people’s company. 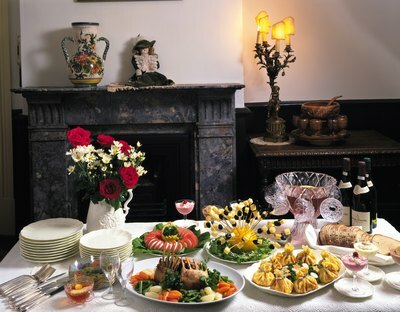 A dinner party can be a fancy sit-down affair or a casual get together where everyone watches a movie or plays a game. When it comes to throwing a dinner party for 20 people there are a few things that can make the process easier and leave yourself more time to spend with your guests. The key to throwing a dinner party for 20 of your closest friends without driving yourself crazy is to plan ahead. Know your menu at least a week in advance, but preferably even earlier. The sooner you know what you will be serving, the more time you have to purchase ingredients and shop for the best deals. When it comes to meat, count on 5 to 6 oz. per person, or 4 to 6 oz. if you are serving buffet-style. 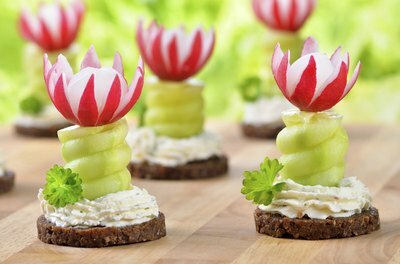 Likewise, figure on needing 8 to 10 appetizer items per person if you are also serving dinner. This includes bread, cheese, a fruit platter or hors d'oeuvres. Of course one of the main considerations when you are serving dinner for 20 people is that the costs be reasonable. There are many ways to keep costs down and still serve an elegant and memorable dinner. 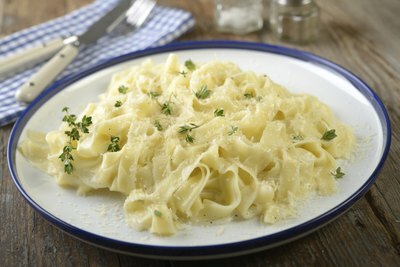 One pound of pasta serves 8 to 10 people buffet style, so pasta with a meat or Alfredo sauce is always a popular choice as is a casserole or hearty soup or stew. For soup, 8 oz. is one serving unless the soup is the main dish, in which case it is closer to 10 ounces. If you are serving premixed salads figure about one handful of salad per person. If you are making a salad, 4 medium heads of lettuce will serve 15 to 20 people. Family Style or Buffet Style? When it comes to actually feeding all of your guests, the choice comes down to family style or buffet style. Often the decision depends on the situation. If you are lucky enough to have a large dining room and seating for 20, then by all means, serve your dinner family style. However for most people, eating buffet style will be the best option. Set out all of the food, have people go through and serve themselves then eat wherever seating is available. Remember that with a buffet many people go back for second helpings so it is best to make a little more than your calculations tell you that you need. Choosing a basic theme can make it easier to plan for and prepare a dinner party for 20 people. The theme does not have to be elaborate. 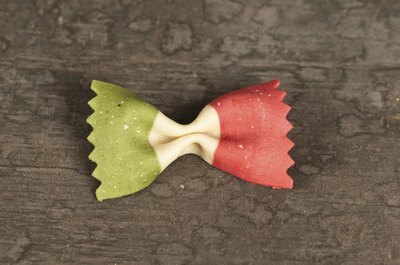 It can be Italian, or comfort food or even a party focused around a specific ingredient such as seafood. Using the estimates above will help you to calculate how much food you are likely to need. In round numbers, figure that each guest will eat about one pound of food, plus beverages and desserts. If you choose to go with a theme for your dinner party be sure to choose something broad enough that you have some flexibility in planning. In addition to calculating the amount of food that you will need you will also want to calculate the amount of drinks. 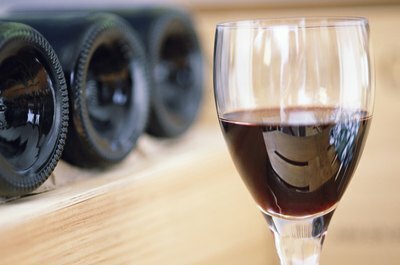 A 750 ml bottle of wine provides six 4-oz. servings and a 750 ml bottle of of spirits contains about 16 1.5-oz. shots. 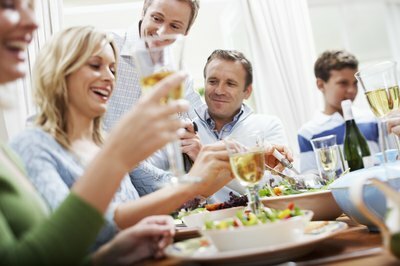 At a dinner party you can expect guests to consume about one drink per hour, although it is likely that not all of those will contain alcohol. A 1-liter bottle of soda contains four 8-oz. servings, and one gallon of coffee makes about 20 cups. Cooking for a crowd requires buying extra ingredients, but doesn't have to be more complicated than cooking for a small group.